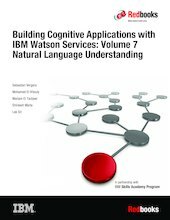 This IBM Redbooks® publication, Volume 7, introduces the Watson Natural Language Understanding service. This service is a collection of text analysis functions that derive semantic information from your content. This book includes a basic description of several of the Natural Language Understanding service features and provides sample code snippets to demonstrate their use. This book includes an example of an application that integrates the Watson Natural Language Understanding service with the Watson Personality Insights and Insights for Twitter services to create a simple application to analyze Tweets from a Twitter handle. You can develop and deploy the sample applications by following along in a step-by-step approach and using provided code snippets. Alternatively, you can download an existing Git project to more quickly deploy the application.